We’ve all heard of pedagogy, right? If you have kids, you’ve definitely heard of it. It refers to the learning for children. So what’s the word for teaching adults? Andragogy. Brought to the forefront of learning theory by Malcolm Knowles, andragogy is the term to describe adult learning. This is distinct from child learning because it is comprised of a different set of principles that govern the learning model, one that is particularly suited to e-Learning. The etymology of the word extends back long before Knowles, however. It was originally used in 1833 by a German educator named Alexander Kapp and really is a derivative of the ancient Greek word for ‘child leading’ — pedagogy. Malcolm Knowles was an American educator (1913 – 1997) who adopted the concept of andragogy and established his principles of adult learning. 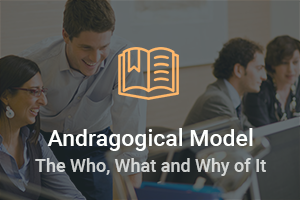 WHAT is andragogy, according to Knowles? Self-concept and motivation to learn — an adult, as noted above, has a strong sense of self-concept and a need to be perceived as having that sense. Therefore, he or she has the motivation to be self-directed in his or her learning opportunities. As opposed to a child, who sometimes needs external motivation to see the value in the learning, an adult can see that value intrinsically. Experience — an adult has a wealth of personal and professional experiences — both good and bad — to draw on when learning, to create a mental backdrop that makes it easy to add new information to existing knowledge. Readiness — an adult, particularly when shown the value of the e-Learning experience and how it relates to their professional experience and knowledge, will be ready and willing to engage. Orientation — whereas a child needs a longer term application of knowledge (reading / writing / math), an adult has learning requirements that are far more specific and immediate, more focused on a specific problem or gap of knowledge. WHY is it important in e-Learning? Self-direction is a key point in andragogy and why it is particularly suited to e-Learning. In fact, the very essence of e-Learning is that a level of independence and self-direction is required in order for it to be effective. Andragogy also postulates that adults need to be involved in the creation and evaluation of their learning opportunities. By definition, e-Learning tends to involve the participants in the creation of materials, sharing of resources and knowledge, peer evaluation and so on. There is a need to explain why things are being taught. Instruction should be task-oriented, rather than rote learning, and activities should be in the context of common tasks performed. The instruction should take into account the variety of experiences and backgrounds of the students, allowing for the fact that different people will have different levels of experience and being adaptable to that fact. Learners should be allowed to discover things for themselves, as part of the instruction, with the instructor providing guidance or help when needed. Those four points are at the very heart of e-Learning and anyone who is teaching adults in an electronic or mobile environment should have them in their toolbox.